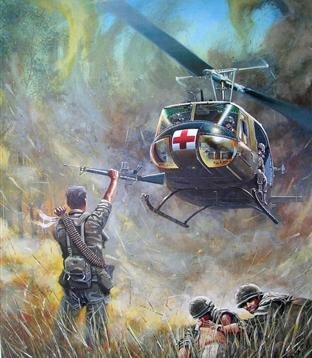 The UH-1 Huey saved untold thousands of lives in it's role as a medical evacuation helicopter. These unarmed aircraft would descend into the heat of battle to transport casualties to evacuation hospitals often within minutes of the injury. Dustoff crews were among the most respected of all helicopter crews due to the nature of their mission, and the manner in which they accomplished it.